Aislinn has always seen faeries. They are powerful, cruel, and dangerous. She and her grandmother have avoided them all of their lives—don’t stare, don’t speak, don’t attract their attention. But now, faeries have started to stalk her, including Keenan, the Summer King. Keenan has searched high and low for his Summer Queen for centuries; without her, summer will die. But so far, no mortal has been able to take the scepter without also taking the Winter Queen’s cold and becoming a Winter Girl, cold until the next girl picks up the scepter. Determined that Aislinn will become his Summer Queen, Keenan pursues her, and all of the rules that used to keep Aislinn safe aren’t working anymore. Her life—freedom, grandmother, and her best friend, Seth—is on the line. I breezed through Wicked Lovely in a day, quickly flipping pages to find out would happen next—where would this fantastical world of Melissa Marr’s take me. The world that she crafted with cruel faeries, all-too-powerful royalty, and faerie rules was fascinating and sucked me in quickly. The characters kept me turning pages and the undertone of darkness kept me trapped—it’s no secret that I love books with a bit of a sharp edge. Wickled Lovely’s characters were hit or miss. Even though Aislinn was the main character, I didn’t really mesh with her. I didn’t feel like she was that thoroughly developed—I kept waiting for her to talk more about her relationship with her Gran, to be a little bit less Oh-this-boy-I-love-loves-me-too-omg-he-is-so-hot, but it never quite happened. At the end of the novel, readers are left with a lot of open questions. What happens to Gran? How did Aislinn’s decisions affect her and her future? I would have liked to see a little more internal conflict. Aislinn’s boyfriend, Seth, wasn’t a terrible character, but I did get irritated with his constant goody-goodiness. I wanted a little drama, a little anger when things happened with Keenan that Aislinn didn’t know about—kissing and maybe more—a little bit of darkness behind the perfect exterior. Speaking of Keenan—talk about missing the chance to dive in deep. He clearly has mommy issues because his mother, the Winter Queen, is a terror, but that is never really discussed. His determination and selfishness is sort of brushed off. I felt he had so much potential that was never realized, especially in relation to Aislinn. Why does he want her so bad? What does he see in her? I was glad that the book never delved into a love triangle—but their relationship still felt very blasé. The only character that I really connected with was Donia—Keenan’s love, the girl who had thought that she could be the Summer Queen and wound up becoming Winter Girl. She’s the real heart of the novel. Marr did a fantastic job writing her pain and anguish as she watched Keenan chase Aislinn as he had chased girls before, the pain of the cold and of the power of the Winter Queen. Despite my beef with Keenan as a character, I felt that this was Donia and Keenan’s story—not Aislinn’s. I almost think that the story would have been better told entirely from her point of view. The darkness, the depression, the bitterness in Donia was well-crafted and a page turner, as well as the choices that she winds up having to make when it boils down to Keenan. The plot moved quickly but was well-thought out, despite the anticlimactic ending and the way it all sort of falls flat at the end. I expected more of a fight from the Winter Queen, and was a little disappointed when I didn’t get it. 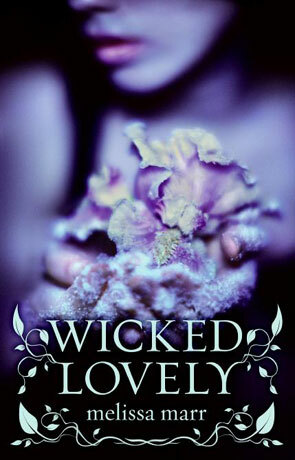 In short, I enjoyed Wicked Lovely. The characters weren’t what I felt they had the potential to be, but where I felt the book really fell short was the point of view that Marr chose—favoring Aislinn over Donia. I haven’t read any of the other books in the series, so it is entirely possible that Donia is a main character in a different novel, and I truly hope so; that’s a book I would gladly read. Written on 2nd December 2013 by Vanessa.